An explosion was heard in Islamabad Monday, residents said. The cause of the blast was not clear. Police in Islamabad said they had no immediate information about it. A private television channel reported two explosions were heard in the nearby city of Rawalpindi, about seven miles from Islamabad. It was not clear if the report related to the same incident. Still no idea what’s happening in here. 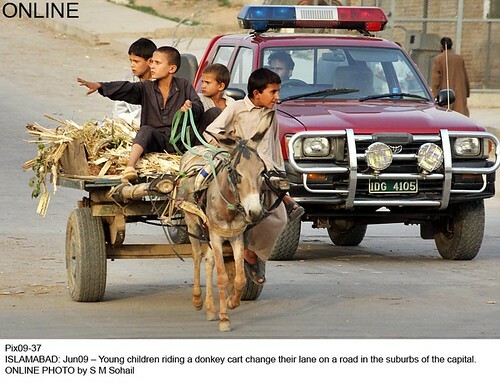 The much fussed Long March to Islamabad ended without any concrete changes. Though it left behind many speculations, good, bad and a few worst. I was flickring through pictures when this picture sent me in a fit of laughter. Irony and Spirit: All Together. 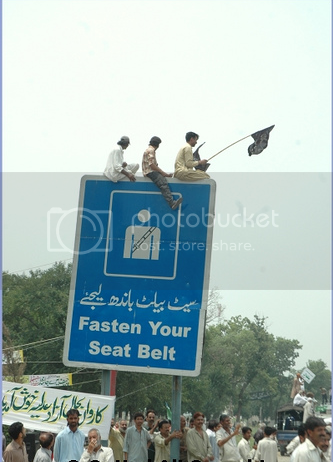 Apart from the brilliant idea to get a clear and uninterrupted view of the dais/stage, I wonder how they managed to climb the huge signboard – that too with flags. When someone dies, someone important actually I and you are of no value, what is the first step taken?? Almost there – yes rename some famous place in honour of that Martyred (by no means I’m trying to ridicule someone who is dead but Get Some Life, No?). Here the Govt is hers truly too … I wonder why they waited for 21st june (Pinky’s bday to do this mass-scale renamings). So to date the order of lord is to rename Islamabad Airport, Rawalpindi general Hospital (RGH) and the-oh-so-famous-and-pindi’s Murree road after Muhtarma Benazir Bhutto. You may be thinking why am I having problems on this decision. To me its kind of obscene to change the decades old names to suddenly a new name. Well, we are in the process of building new roads and avenues … why not name them after her or anyone of your choice?? Huh? You say what? I wonder how long it’d take the next govt to take these orders back….! Read more on BBC and DT. 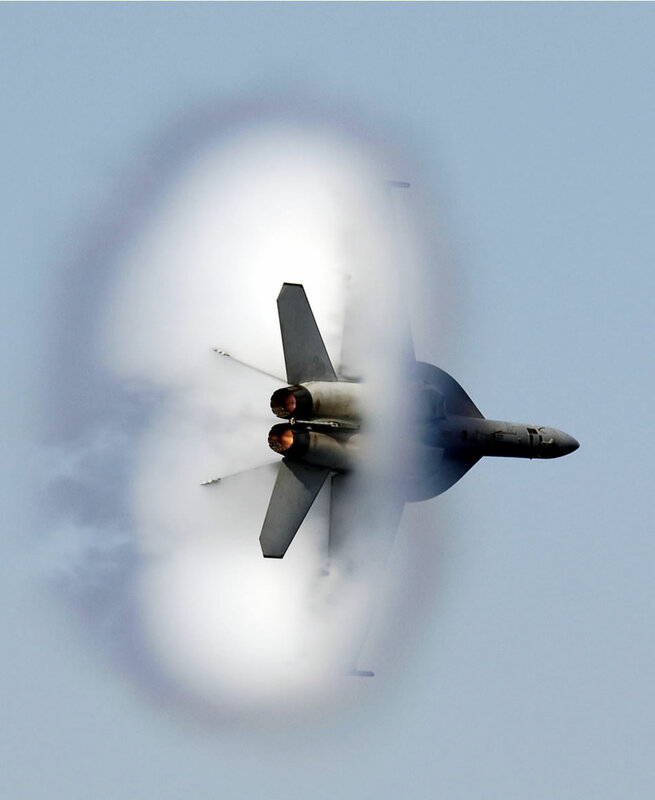 143, originally uploaded by sazain. 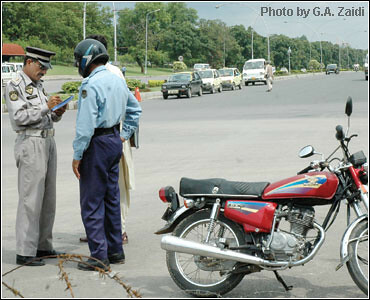 islamabad traffic police catching criminal police, originally uploaded by www.first-pakistan.blogspot.com.